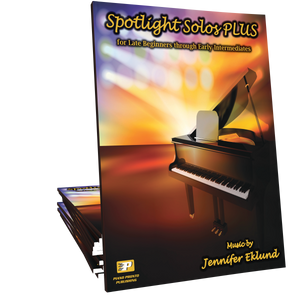 Kick-start your creativity with eight elegant solos for intermediates of all ages composed by Jennifer Eklund. 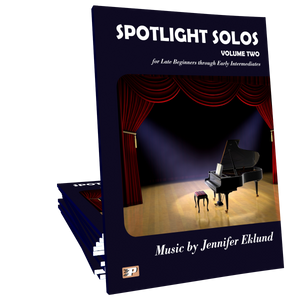 Each solo includes an accompanying illustration created by Susan Hong. The soothing coloring activities allow the player to set a color palette for each piece to aid in interpreting the music. Simply a stunning book, both the music and the coloring pages. Tweens and early teens, especially, will love this book! I gave this book to two preteens as a recital prize. They love it. One is meticulous about coloring the pages after she perfects the song. Beautiful pages to go with beautiful music. Getting 2 more now for prizes for recital for 2 more girls this year. I have a teenage girl who is going to love these pieces!! So beautiful!! Simply beautiful! I just sightread through the book and some of the pieces brought tears to my eyes. They were so touching - a very unique flavor mix of melancholy and peacefulness. 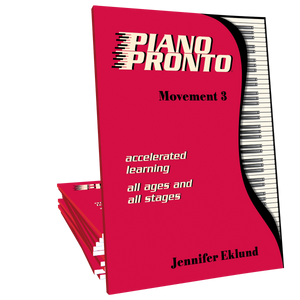 It's hard to pick a favorite Piano Pronto book, but this could be it! 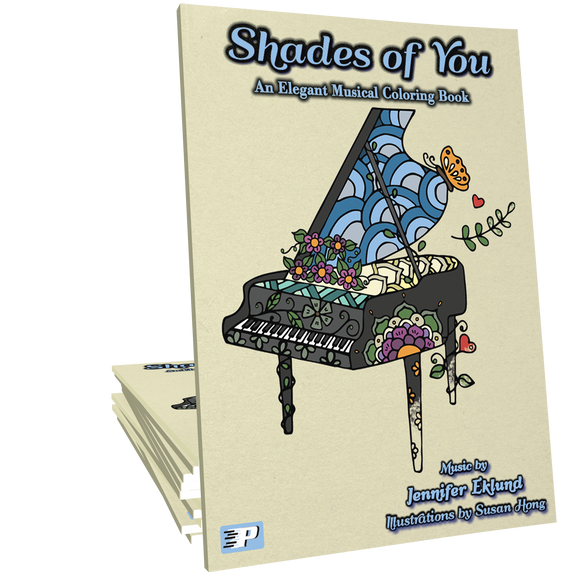 The combination of music and beautiful coloring pages will no doubt be a hit and practice motivator for my tweens, teens and adults! I have a student that this will be perfect for. Beautifully done. I can't wait to play them myself. I'm excited to order Shades of You. What a great idea - to combine art and music. I have several students in mind who I am sure will love to play the music in this book as well as to color the beautiful artwork. A student just picked this out for the the beautiful coloring and Falling Leaves. 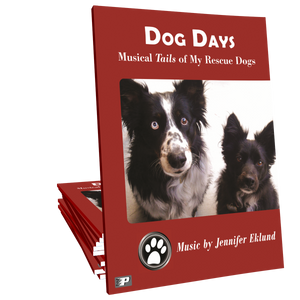 (She's just finishing Dog Days and this will be her new "summer book"!) I just might be purchasing my own soon! This book is simply PERFECT!!!!! This book is every "tween to teen" dream! Beautifully written pieces that fall easily under the hands, but will need some careful balance (translate: opportunity for technical work!). And you get pictures to color, too? Win-win! I sat down with the beautiful Hardcopy and played through all of the songs. I loved all of them and my husband loved listening to them. Can't wait to put in a student's hands this summer! Can't say enough about this new collection! Can't wait to get it in hard copy either. LOVE all of them! Every piece evokes its title completely and thoroughly. Great job Jennifer!